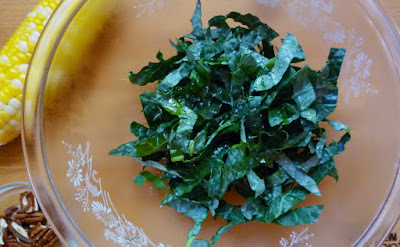 I have been enjoying the Tuscan Kale from the farmers' market so much this year. For many years Tuscan kale (aka Lacinato Kale...Dinosaur Kale...Cavolo Nero....) was not being grown for any of my local markets. I began reading about it long before I was even able to get my hands on some from the grocery store. It was longer still before I began finding it from local sources. Now, most of the farmers at my market are growing it....and this year I have been enjoying a steady and delicious supply since early March. I mentioned in that post in March that kale salads are best when dressed ahead. This is true for most raw vegetable salads... I have recently posted two perfect examples in my summer coleslaw and in a grated carrot salad I shared last winter. When given a bit of time, salt and acidity...even the fat...help to soften the crunch of uncooked vegetables. For my summer kale salad instead of dressing this salad ahead with the actual vinaigrette, I took my lead from a recipe by Marcus Samuelsson and just massaged some cider vinegar, salt and olive oil into the kale leaves (similar to the way I treat my grated carrot salad and my coleslaw). When you finish the salad right before serving you may use any favorite, tangy vinaigrette. I have used a couple of different dressings...both of which I often keep on hand. One is the mustardy red wine vinaigrette I shared last December. This one works well for this salad because it goes well with sausage (a prominent component of the salad). The other is the vinaigrette I posted for a Spring Vegetable Salad in June. This latter vinaigrette is a good fit because it is tangy enough to stand up to raw vegetables....and as I alluded to above, I think of kale as really being more like a shredded vegetable than a lettuce. 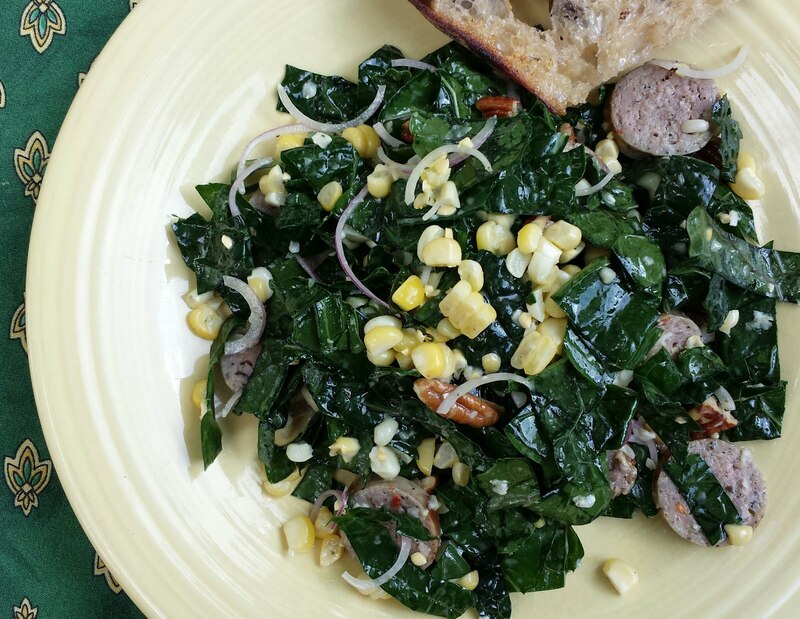 Besides the Italian Sausage, my summer kale salad includes a generous quantity of sweet corn. I love corn. From the time the early corn hits the market sometime in late June or early July until the very end of the main crop during the month of September, I always have sweet corn on hand. Roasted, it makes a substantial and delicious addition to summer salads, sides and pastas. It was inevitable that I would at some point pair it with kale in a salad (I have already paired it with kale in a pasta!). Toasted pecans, finely sliced red onions and some nutty shaved Parmesan complete the assembly. 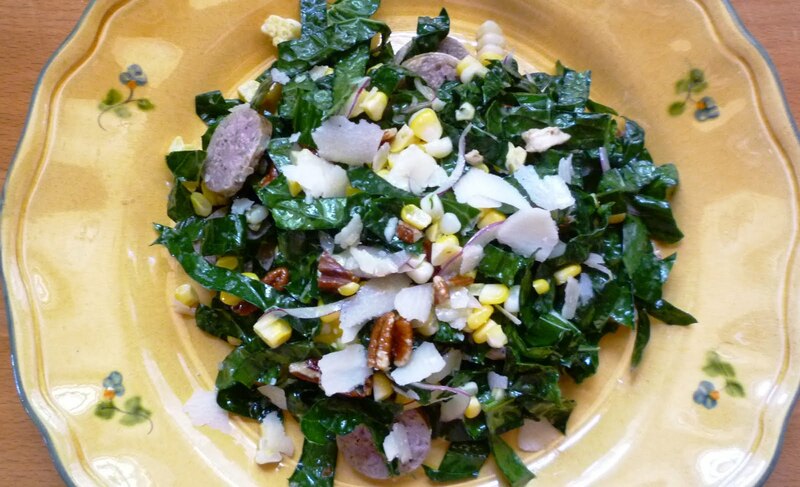 This summer kale salad is surprisingly substantial. I think it makes a great entrée on a hot summer night. But if you like, you can omit the sausage and serve it as a side to a big grilled steak or chop...or a nice roast chicken. When ready to make the salad, place the kale in a salad bowl. Add the cider vinegar, oil and salt and massage well. Cover with plastic wrap and chill for 30 minutes. Meanwhile place the corn directly on the rack of a preheated 375° oven. Roast for 20 minutes. Remove from the oven and strip away the husks and silks as soon as the corn is cool enough to handle. (I typically do this immediately. I simply work quickly...but you can use towels to grab the husks and silks and pull them away. The sooner you do this the better since the corn will continue to steam inside the intact husk.) Cut the corn away from the cob. You should have about a cup of roasted kernels. Set aside. While the corn roasts, cook the sausage and toast the pecans. Brown the sausage in a small ovenproof sauté pan. Transfer to the oven to finish (in the sauté pan) to finish the cooking process. Set aside to rest. Place the pecans in a small baking dish/pan in the oven alongside the corn and toast until fragrant and beginning to take on a pale golden color (about four or five minutes). When done, drizzle with a small amount of olive oil and season with kosher salt. When cool enough to handle, coarsely crumble. 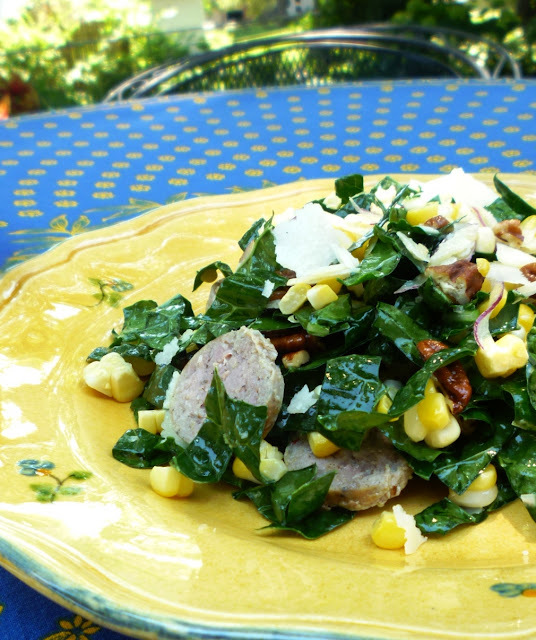 When ready to serve the salad, slice the sausage in quarter-inch thick rounds. 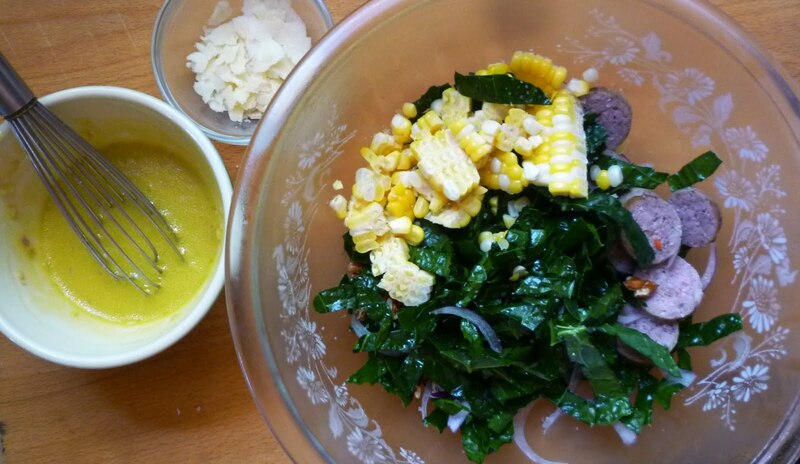 Add to the bowl with the kale. Add the corn, red onion, pecans and Parmesan. Season with salt & pepper. Drizzle with enough of your vinaigrette to lightly coat all of the ingredients. Toss well. Taste and correct the seasoning...adding more of the vinaigrette if needed. Divide between plates and serve with some crusty bread. Serves 2 as an entrée.